South Korean President Moon Jae-in has urged the US to come to terms with the North’s demand for a formal declaration of an end to the Korean war, amid growing differences between the two major allies. “The North has stopped all nuclear and missile tests, dismantled its only nuclear test site and is now dismantling its missile engine test facilities, and is promising to take steps toward dismantling its Yongbyon nuclear complex if the US takes corresponding measures,” the South Korean president further argued as quoted in a transcript released by the presidential Blue House. 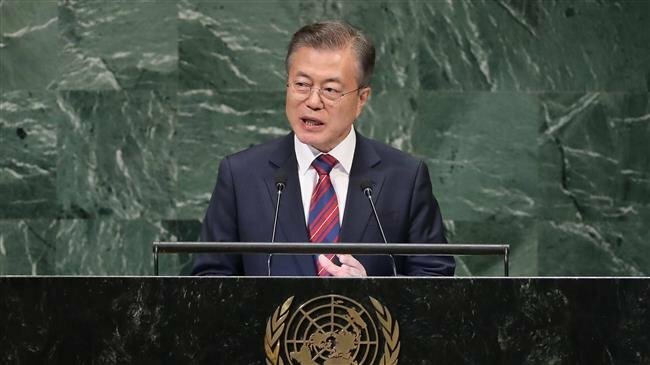 Moon’s remarks, which were made just ahead of his departure on Saturday for a tour of European capitals, further underlines rising differences between Seoul and Washington, which maintains 28,500 military forces stationed in South Korea to “defend” it from its northern rival. South Korea’s Foreign Minister Earlier Kang Kyung-wha told the nation’s legislators earlier this week that Seoul was reconsidering its own sanctions relief against Pyongyang amid reports that she later backtracked, with her ministry announcing that no active review of its North Korea policy was in the works.